First, it is important to understand what a Google account is. It is not a gmail account. A Google account is a unified login that gives you access to many Google tools such as Docs, Groups, Adwords, Analytics, etc. A Google account can be associated with any email address. For example, you can use your email address (johnsmith@designswithmerit.com), not just a gmail address. A Google Account is a username and password that allows a person to sign into Google Drive. A Google Doc can be a document, spreadsheet, powerpoint presentation, drawing, image, or form. Google Docs can only be edited within the Google Docs application. With the surge of Google Adwords and Free Google Analytics tracking, the user most likely has a google account, but let’s assume they don’t. 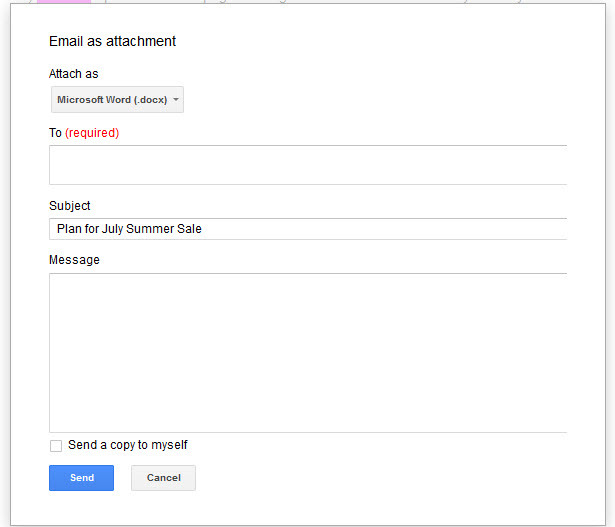 Insert the email address, Subject and Email Message. Click Send. Let’s say you are trying to share a Google document with a big group of people who do not have Google Accounts. And to mix things up even more, you need them to make edits to the document. 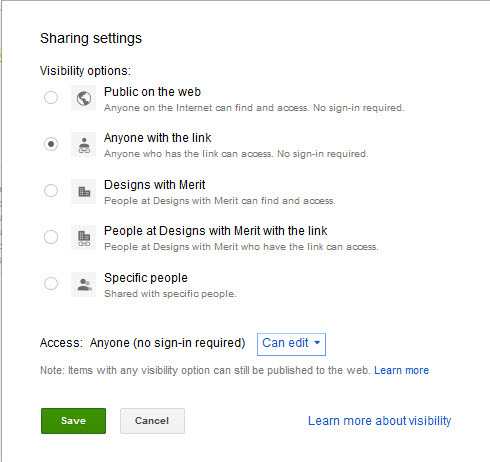 The best thing to do is change the visibility options of the document to “Anyone with a link” You can change this setting by opening up the Google Doc –>Clicking the Share button in the upper right hand corner –> Select Change under the Who has access portion. Select the second option to anyone with a link —> can edit–>click save. Copy the link in the Link to share field. This is the link you should share with people who need to make edits to the Doc. Once you share the Link to share link, your editors will be able to access the Doc in edit mode without being asked to sign in. They will appear as “Anonymous.” Once everyone is completed making edits, change the privacy setting back to private so they cannot make edits in the future and accidentally delete your document. NOTE: Do not share the URL you see in your browser’s URL menu because that is a private link only for you. The third option would be to have the person set up a Google account that they can use for all of Google. This will give them access to Google Docs, Google Drive, Google Apps, Google+, Hangouts, and much more. If you have questions about setting up a Google Account or sharing your Google Docs with a non-Google user, contact us at 415-225-4722.